And so, cook green curry chicken, I did. I decided to record down the process because it was fairly easy and fuss free to make, and I was surprised at how authentic and genuine tasting my home made, first trial green curry chicken was! If you love sweet, thick, spicy, meaty curries… you’re going to love this. Trust me when I say you really don’t have to be a good cook to make this well because essentially it is chopping stuff up and throwing everything into a pot and stir, almost zero kills involved. I know I still owe some of you cooking recipes of ginger chicken, rosti, etc.. sorry for the wait, but hopefully this will appease you for now Rosti is going to be next up on the list if things go well in the kitchen. 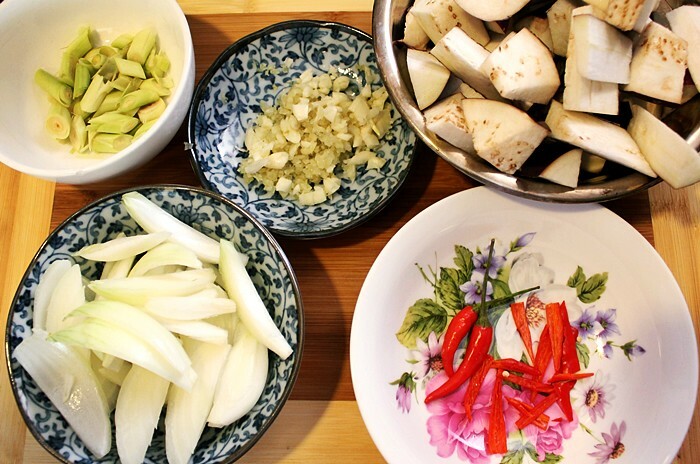 So here’s how you can make Green Curry Chicken in your very own kitchen at home, all in just 7 simple steps! 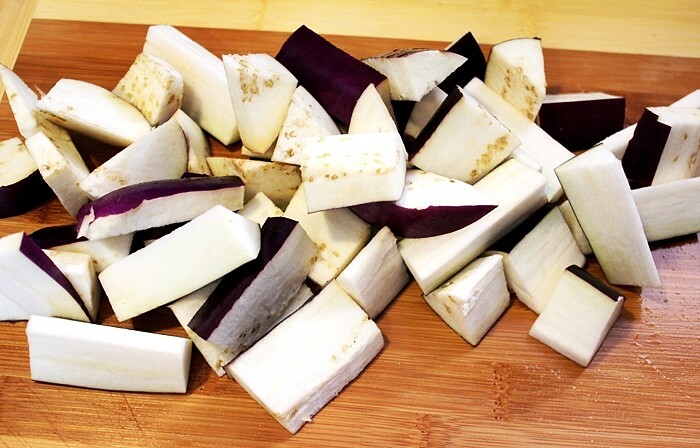 ♥ — chilli padi, deseeded, cut into long strips.. add according to your own spice level, I used 3. 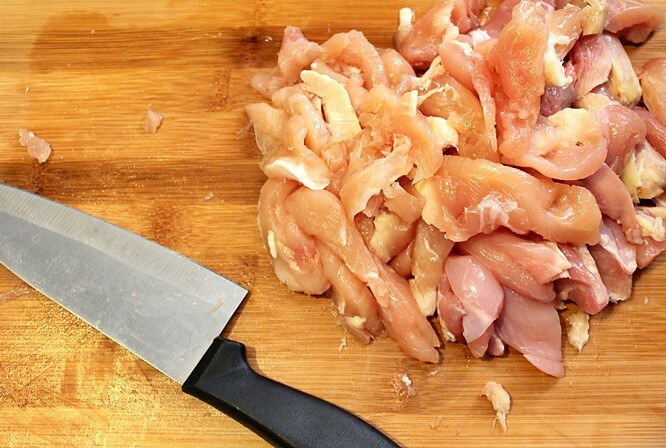 Step 1: Slice chicken into small pieces. 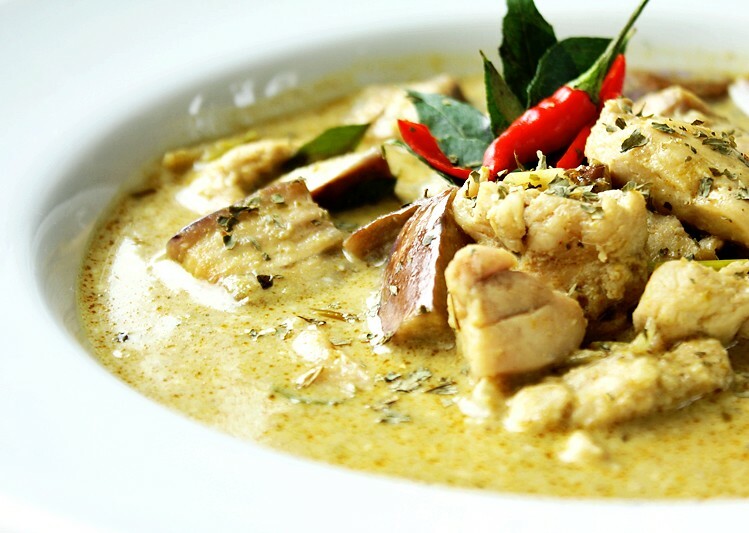 You don’t really want big chunks of meat in green curry chicken, you’d want thin-ish strips for an easy bite. 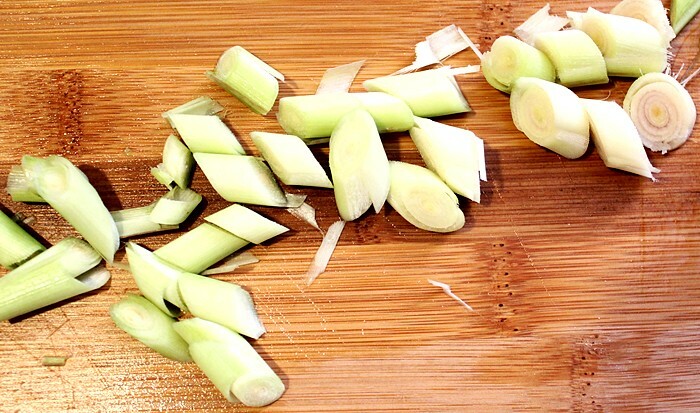 Step 2: Prepare lemon grass stalks by cutting away the bottom bulb. I chose to chop mine finely like this, but if you don’t like biting into lemongrass bits then you can opt to use it whole, or cut into strips instead. Step 4: With a tiny bit of oil and about 2 tablespoons water, stir fry all the ingredients listed in the Chicken Mixture with medium-low heat, until the meat seems about 90% cooked. Don’t overcook this or your chicken will be too dry and hard, it will cook even further in your soon-to-be pot of curry anyway. 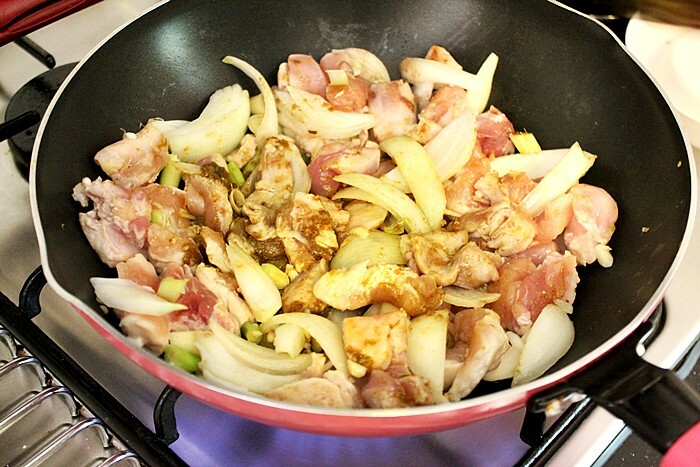 Remove all of chicken mixture, set aside on a plate. 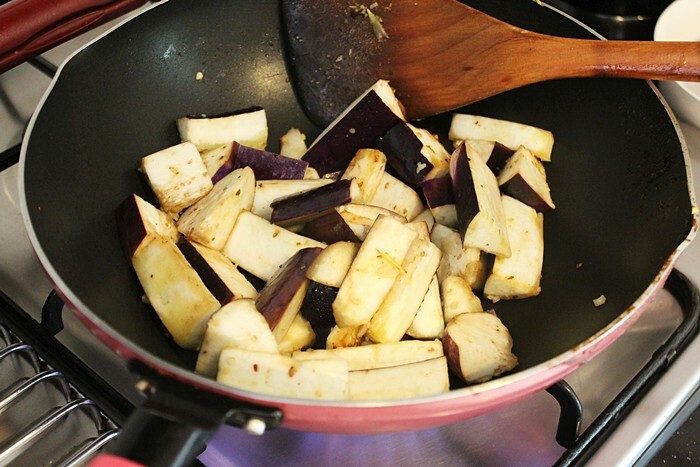 Step 5: In the same pan, cook eggplant over high heat with a dash of salt & pepper until it’s about done but still firm, not to the point that it’s mushy…. If it’s mush before you put it in the curry, it’s going to be a complete sludge by the time it actually is IN your curry. Once done, also set this aside on a plate. Step 6: Combine all ingredients in Curry Mixture in a large pot and bring to a boil, then let it simmer over low heat for 5 minutes, stirring constantly so that it is evenly mixed through. Do a taste test and at this point in time, you have to decide how thick, spicy, or sweet you like your curry. I think curry preferences can differ greatly from person to person, so I’ve just given you a rough guide on the proportions of ingredients I used, but you should definitely alter it to how you like it! I like my curry extremely coconuty, quite sweet, and really spicy. (Y) If it’s not thick enough, let it simmer awhile on the stove, but bear in mind the longer it simmers the more intense the flavors are going to get. 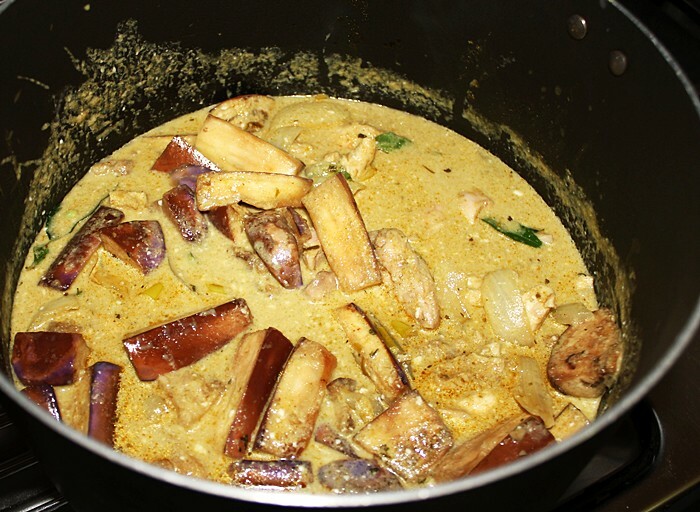 Step 7: Once you’ve got your curry taste and consistency spot on, pour in the Eggplant & Chicken Mixture into the pot, and stir. That’s all there is to cooking green curry chicken!!! I know it doesn’t look like very much now, but give me a sec….. this will all come together…. 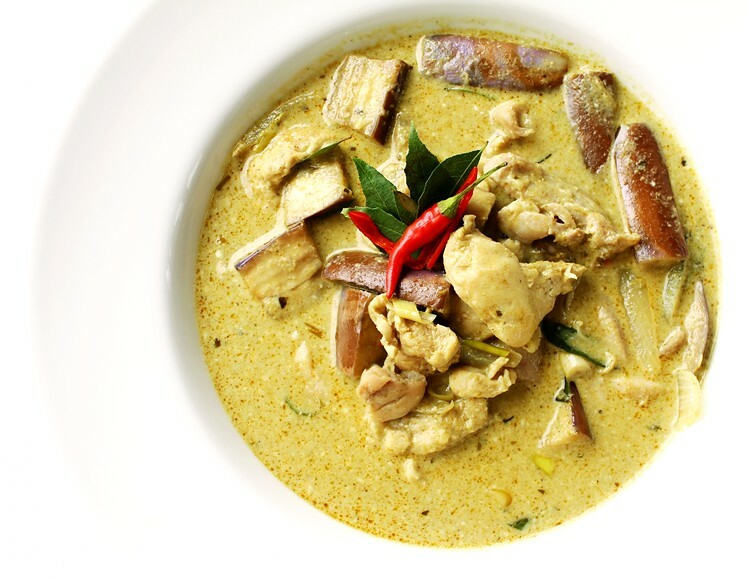 Serve your Thai green curry chicken hot, with jasmine rice! I garnished mine with chilli padi and leftover curry leaves. If you attempted this correctly, your eggplant should be soft but not mushy, the chicken pieces still tender and your curry full of wonderful different spices that literally explode in your mouth. I can take super spicy stuff so I went a little nuts with the chilli, but I think next time I’ll tone it down a little so my family members don’t break into perspiration when they’re eating it. There are many things I don’t go out to order in restaurants any more after I’ve learned to cook them, and this will be one of them. The ingredients are inexpensive, it easily feeds my whole family and I think it tastes a helluvalot better than a lot of variations I can get outside. 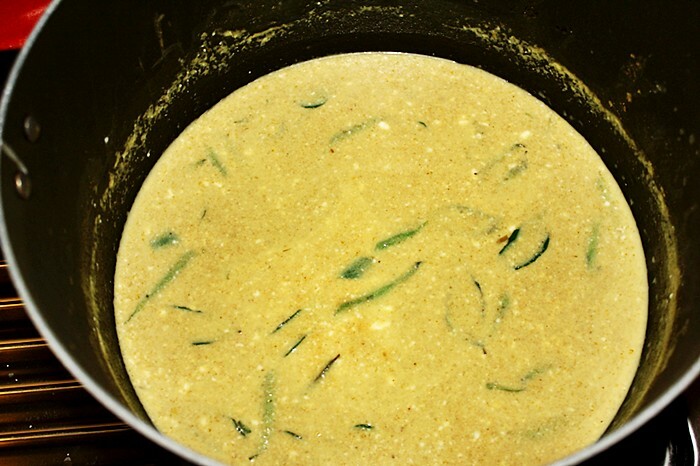 Although this is a traditional Thai dish, I don’t claim that my recipe is the professional / authentic / genuine / traditional way of making Thai green curry… so if you’re a Thai person and this is totally different from your traditional recipe, please don’t get offended!!! This is just how I do my cooking at home, and I want to share with people easy & yummy ways in the kitchen, which may not always be the classic way of doing things, but it works for me. 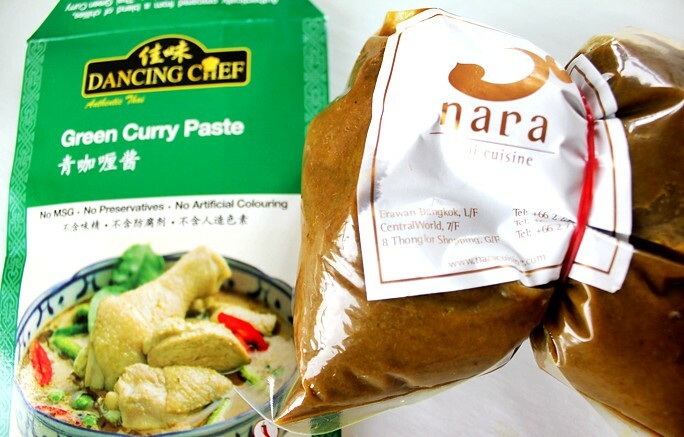 P.S – Do choose a good brand of green curry paste. Although I know this is kinda redundant advice because you’re not going to know wth it tastes like until you cook it anyway…. -_- but these were the ones I used. I used two different packets to try out. Left one from NTUC Fairprice, right one from Thailand… my brother’s gf bought it when she went to Thailand some months back. Even though the left one claims to be authentic obviously nothing beats the real thing on the right!! The right one was super spicy, and the left one super salty… I had to balance it all out with adjusting the coconut milk to water to sugar ratio. Have fun making green curry chicken, and pooping fire at night!!!! This would be such a great winter dish because its so spicy and shiok that it kept my tummy warm for HOURS after I’d consumed it. You know how some people say certain foods are soul warming, heart warming even… this one confirm tummy warming. Lol. This entry was posted in food / cooking, recipes by shiberty. Bookmark the permalink. 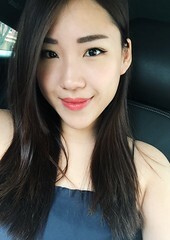 Hi Jess! I’ve been wanting to leave a comment.. A year ago I made this dish when I was in shanghai during winter ..! It’s perfect! It wasn’t too coconutyit was curry like thick savoring curry ( none of those coconut soup they serve in Thai rests here in shanghai) it was flavourful and the best part it tasted waaayy better the day after!! Thank you Jess! !